Val's Quilting Studio : Tuesday Archives #64: Rainbows! I remember Kate, who blogs at Life In Pieces, making this wonderful jigsaw rainbow last year, and after a bit of searching through her archives...I found it! This is it finished as a flimsy and I'm hoping you'll like up your finished post Kate, for if I remember correctly, you made this one for your daughter. I know many of us rainbow posts, so I'm going to keep today's intro short. I'm off to search through my own archives as well and you can all start sharing. It will be great to have our rainbow inspiration collected in one spot don't ya think. PS: I'm also working on creating a page that will be a directory of all our past Tuesday Archives themes. I think it will become a quick reference tool for us to use to revisit some of those old themes full of linked inspiration! 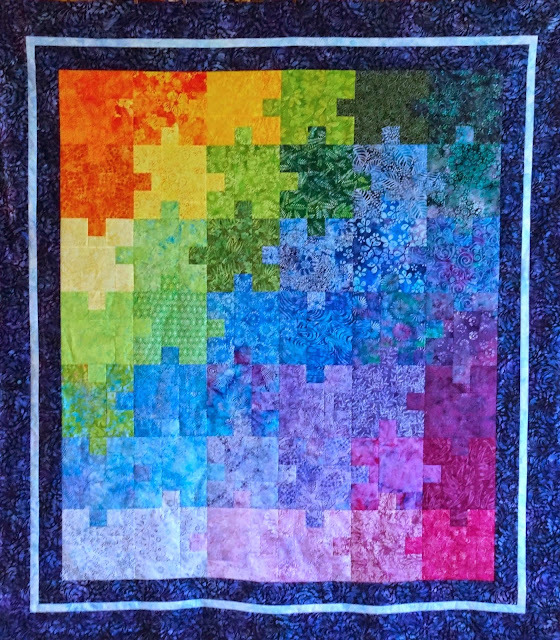 I almost thought I didn't have a full quilt - I make a lot of 'rainbow' blocks with the RSC project, but they get passed on to Sarah's group. Then a huge DUH happened - one of my first quilts!! Ha Ha, I stopped at three links. I have made many, many rainbow quilts. Four out of five beds in our house have rainbow quilts on them, and one of my summer projects is to get that fifth bed adorned with a rainbow and finish my Gravity quilt for my bed! Sorry Val and others. For some reason this morning, I was thinking the topic was flamingos and posted the wrong block. I'll write it off to old age. So I just know posted my rainbow. In one year of blogging I had to choose between three bunny related posts for last week's link but I have zero rainbow posts! I can't believe it is taking me so long to build a rainbow worthy stash. I love your little JRT. I have a little broken coat cutie too. I'm a bit late joining the linky today, only so much time in the morning before I have to head out to work. So I got quite the surprise when I checked your Tuesday Archive post and saw a very familiar quilt. Jigsaw is one of my favorites, thank you so much for featuring it today. Drama Teen got quite a kick out of seeing it "reblogged". I'm ready to put the binding on last year's Rainbow Scrap Challenge quilt, so I'll have two rainbow projects finished. this jigsaw quilt is lovely, did look at the tehmpale for making one myself when at a quilt show, seeing this wish I had boiught it. Argh, no rainbow quilts in my archive. But the ones here sure look pretty! I almost forgot about my Rainbow Bargello wall hanging. Perhaps I should quilt it, since the top has been finished for almost 2 years. I LOVE rainbow quilts and lately have bought a few kits and maybe a few FQ rainbow bundles for future projects. What are next month's topics? Love the new blog header with the handsome Mr. Jackson!